For other uses, see Roman legion (disambiguation). A Roman legion (romanum legio) (from Latin legio "military levy, conscription", from legere "to choose") was a large unit of the Roman army. In the early Roman Kingdom "legion" may have meant the entire Roman army but sources on this period are few and unreliable. The subsequent organization of legions varied greatly over time but legions were typically composed of around five thousand soldiers. During much of the republican era, a legion was divided into three lines of ten maniples. In the late republic and much of the imperial period (from about 100 BC), a legion was divided into ten cohorts, each of six (or five) centuries. Legions also included a small ala, or cavalry, unit. By the third century AD, the legion was a much smaller unit of about 1,000 to 1,500 men, and there were more of them. In the fourth century AD, East Roman border guard legions (limitanei) may have become even smaller. In terms of organisation and function, the republican era legion may have been influenced by the ancient Greek and Macedonian phalanx. For most of the Roman Imperial period, the legions formed the Roman army's elite heavy infantry, recruited exclusively from Roman citizens, while the remainder of the army consisted of auxiliaries, who provided additional infantry and the vast majority of the Roman army's cavalry. (Provincials who aspired to citizenship gained it when honourably discharged from the auxiliaries.) The Roman army, for most of the Imperial period, consisted mostly of auxiliaries rather than legions. Because legions were not permanent units until the Marian reforms (c. 107 BC), and were instead created, used, and disbanded again, several hundred legions were named and numbered throughout Roman history. To date, about 50 have been identified. The republican legions were composed of levied men that paid for their own equipment and thus the structure of the Roman army at this time reflected the society, and at any time there would be four consular legions (with command divided between the two ruling consuls) and in time of war extra legions could be levied. Toward the end of the 2nd century BC, Rome started to experience manpower shortages brought about by property and financial qualifications to join the army. This prompted consul Gaius Marius to remove property qualifications and decree that all citizens, regardless of their wealth or social class, were made eligible for service in the Roman army with equipment and rewards for fulfilling years of service provided by the state. The Roman army became a volunteer, professional and standing army which extended service beyond Roman citizens but also to non-citizens that could sign on as auxillia (auxiliaries) and were rewarded Roman citizenship upon completion of service and all the rights and privileges that entailed. In the time of Augustus, there were nearly 50 upon his succession but this was reduced to about 25–35 permanent standing legions and this remained the figure for most of the empire's history. The legion evolved from 3,000 men in the Roman Republic to over 5,200 men in the Roman Empire, consisting of centuries as the basic units. Until the middle of the first century, ten cohorts (about 500 men) made up a Roman legion. This was later changed to nine cohorts of standard size (with six centuries at 80 men each) with the first cohort being of double strength (five double-strength centuries with 160 men each). By the fourth century AD, the legion was a much smaller unit of about 1,000 to 1,500 men, and there were more of them. This had come about as the large formation legion and auxiliary unit, 10,000 men, was broken down into smaller units - originally temporary detachments - to cover more territory. In the fourth century AD, East Roman border guard legions (limitanei) may have become even smaller. In terms of organisation and function, the Republican era legion may have been influenced by the ancient Greek and Macedonian phalanx. A legion consisted of several cohorts of heavy infantry known as legionaries. It was almost always accompanied by one or more attached units of auxiliaries, who were not Roman citizens and provided cavalry, ranged troops and skirmishers to complement the legion's heavy infantry. The recruitment of non-citizens was rare but appears to have occurred in times of great need; For example, Caesar appears to have recruited the Legio V Alaudae mostly from non-citizen Gauls. In the period before the raising of the legio and the early years of the Roman Kingdom and the Republic, forces are described as being organized into centuries of roughly one hundred men. These centuries were grouped together as required and answered to the leader who had hired or raised them. Such independent organization persisted until the 2nd century BC amongst light infantry and cavalry, but was discarded completely in later periods with the supporting role taken instead by allied troops. The roles of century leader (later formalized as a centurion), second in command and standard bearer are referenced in this early period. Rome's early period is undocumented and shrouded in myths, but those myths tell that during the rule of Servius Tullius, the census (from Latin: censeō – accounting of the people) was introduced. With this all Roman able-bodied, property-owning male citizens were divided into five classes for military service based on their wealth and then organized into centuries as sub-units of the greater Roman army or legio (multitude). Joining the army was both a duty and a distinguishing mark of Roman citizenship; during the entire pre-Marian period the wealthiest land owners performed the most years of military service. These individuals would have had the most to lose should the state have fallen. At some point, possibly in the beginning of the Roman Republic after the kings were overthrown, the legio was subdivided into two separate legions, each one ascribed to one of the two consuls. In the first years of the Republic, when warfare was mostly concentrated on raiding, it is uncertain if the full manpower of the legions was summoned at any one time. In 494 BC, when three foreign threats emerged, the dictator Manius Valerius Maximus raised ten legions which Livy says was a greater number than had been raised previously at any one time. Velites (light infantry): The velites were mainly poorer citizens who could not afford to equip themselves properly. Their primary function was to act as skirmishers – javelin-throwers, who would engage the enemy early in order either to harass them or to cover the movement of troops behind them. After throwing their javelins, they would retreat through the gaps between the maniples, screened from the attack of the enemy by the heavy infantry lines. With the shortage of cavalry in the army of the early to mid Republican army, the velites were also used as scouts. They did not have a precise formal organization or formation. The triarii (sing. triarius) were the veteran soldiers, to be used in battle only in extreme situations; they rested one knee down when not engaged in combat. The triarii served primarily as reserves or barrier troops designed to backstop the hastati and principes, and were equipped with long hastae (spears) rather than the pilum and gladius (the hastati and principes stopped using spears in 387 BC). Thus armed, they fought in a phalanx formation. The sight of an advancing armored formation of triarii legionaries frequently discouraged exultant enemies in pursuit of retreating hastati and principes troops. Ad triarios redisse – To fall back upon the triarii was a Roman idiom – meaning to use one's last resort. The Marian reforms (of Gaius Marius) enlarged the centuries to 80 men, and grouped them into six-century "cohorts" (rather than two-century maniples). Each century had its own standard and was made up of ten units (contubernia) of eight men who shared a tent, a millstone, a mule and cooking pot. At the end of the 2nd century BC, Gaius Marius reformed the previously ephemeral legions as a professional force drawing from the poorest classes, enabling Rome to field larger armies and providing employment for jobless citizens of the city of Rome. However, this put the loyalty of the soldiers in the hands of their general rather than the State of Rome itself. This development ultimately enabled Julius Caesar to cross the Rubicon with an army loyal to him personally and effectively end the Republic. The legions of the late Republic and early Empire are often called Marian legions. Following the Battle of Vercellae in 101 BC, Marius granted all Italian soldiers Roman citizenship. He justified this action to the Senate by saying that in the din of battle he could not distinguish Roman from ally. This effectively eliminated the notion of allied legions; henceforth all Italian legions would be regarded as Roman legions, and full Roman citizenship was open to all the regions of Italy. 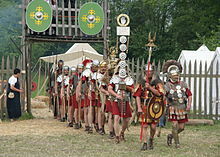 At the same time, the three different types of heavy infantry were replaced by a single, standard type based on the Principes: armed with two heavy javelins called pila (singular pilum), the short sword called gladius, chain mail (lorica hamata), helmet and rectangular shield (scutum). The role of allied legions would eventually be taken up by contingents of allied auxiliary troops, called Auxilia. Auxilia contained specialist units, engineers and pioneers, artillerymen and craftsmen, service and support personnel and irregular units made up of non-citizens, mercenaries and local militia. These were usually formed into complete units such as light cavalry, light infantry or velites, and labourers. There was also a reconnaissance squad of 10 or more light mounted infantry called speculatores who could also serve as messengers or even as an early form of military intelligence service. As part of the Marian reforms, the legions' internal organization was standardized. Each legion was divided into cohorts. Prior to this, cohorts had been temporary administrative units or tactical task forces of several maniples, even more transitory than the legions themselves. Now the cohorts were ten permanent units, composed of 6 centuries and in the case of the first cohort 5 double strength centuries each led by a centurion assisted by an optio. The cohorts came to form the basic tactical unit of the legions. Ranking within the legion was based on length of service, with the senior Centurion commanding the first century of the first cohort; he was called the primus pilus (First Spear), and reported directly to the superior officers (legates and tribuni). All career soldiers could be promoted to the higher ranks in recognition of exceptional acts of bravery or valour. A newly promoted junior Centurion would be assigned to the sixth century of the tenth cohort and slowly progressed through the ranks from there. A typical legion of this period had 5,120 legionaries as well as a large number of camp followers, servants and slaves. Legions could contain as many as 11,000 fighting men when including the auxiliaries. During the Later Roman Empire, the legion was reduced in size to 1,000 to allow for easier provisioning and to expand the regions under surveillance. Numbers would also vary depending on casualties suffered during a campaign; Julius Caesar's legions during his campaign in Gaul often only had around 3,500 men. After the Marian reforms and throughout the history of Rome's Late Republic, the legions played an important political role. By the 1st century BC, the threat of the legions under a demagogue was recognized. Governors were not allowed to leave their provinces with their legions. When Julius Caesar broke this rule, leaving his province of Gaul and crossing the Rubicon into Italy, he precipitated a constitutional crisis. This crisis and the civil wars which followed brought an end to the Republic and led to the foundation of the Empire under Augustus in 27 BC. Generals, during the recent Republican civil wars, had formed their own legions and numbered them as they wished. During this time, there was a high incidence of Gemina (twin) legions, where two legions were consolidated into a single organization (and was later made official and put under a legatus and six duces). At the end of the civil war against Mark Antony, Augustus was left with around fifty legions, with several double counts (multiple Legio Xs for instance). For political and economic reasons, Augustus reduced the number of legions to 28 (which diminished to 25 after the Battle of Teutoburg Forest, in which 3 legions were completely destroyed by the Germanics). Beside streamlining the army, Augustus also regulated the soldiers' pay. At the same time, he greatly increased the number of auxiliaries to the point where they were equal in number to the legionaries. He also created the Praetorian Guard along with a permanent navy where served the liberti, or freed slaves. The legions also became permanent at this time, and not recruited for particular campaigns. 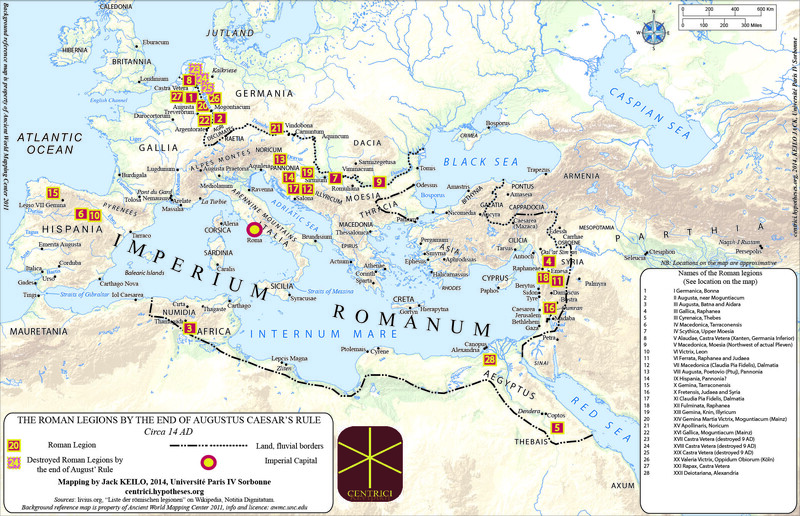 They were also allocated to static bases with permanent castra legionaria (legionary fortresses). Augustus' military policies proved sound and cost effective, and were generally followed by his successors. These emperors would carefully add new legions, as circumstances required or permitted, until the strength of the standing army stood at around 30 legions (hence the wry remark of the philosopher Favorinus that It is ill arguing with the master of 30 legions). 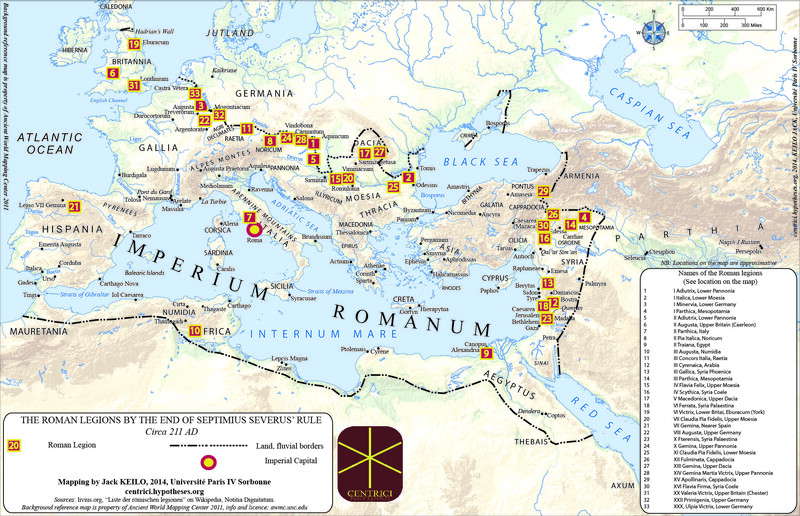 With each legion having 5,120 legionaries usually supported by an equal number of auxiliary troops (according to Tacitus), the total force available to a legion commander during the Pax Romana probably ranged from 11,000 downwards, with the more prestigious legions and those stationed on hostile borders or in restive provinces tending to have more auxiliaries. By the time of the emperor Severus, 293-211, the auxiliaries may have composed 55 to 60% of the army, 250,000 of 447,000. Some legions may have even been reinforced at times with units making the associated force near 15,000–16,000 or about the size of a modern division. Throughout the imperial era, the legions played an important political role. Their actions could secure the empire for a usurper or take it away. For example, the defeat of Vitellius in the Year of the Four Emperors was decided when the Danubian legions chose to support Vespasian. In the Later Roman Empire, the number of legions was increased and the Roman Army expanded. There is no evidence to suggest that legions changed in form before the Tetrarchy, although there is evidence that they were smaller than the paper strengths usually quoted. The final form of the legion originated with the elite legiones palatinae created by Diocletian and the Tetrarchs. These were infantry units of around 1,000 men rather than the 5,000, including cavalry, of the old Legions. The earliest legiones palatinae were the Lanciarii, Joviani, Herculiani and Divitenses. The 4th century saw a very large number of new, small legions created, a process which began under Constantine II. In addition to the elite palatini, other legions called comitatenses and pseudocomitatenses, along with the auxilia palatina, provided the infantry of late Roman armies. The Notitia Dignitatum lists 25 legiones palatinae, 70 legiones comitatenses, 47 legiones pseudocomitatenses and 111 auxilia palatina in the field armies, and a further 47 legiones in the frontier armies. Legion names such as Honoriani and Gratianenses found in the Notitia suggest that the process of creating new legions continued through the 4th century rather than being a single event. The names also suggest that many new legions were formed from vexillationes or from old legions. In addition, there were 24 vexillationes palatini, 73 vexillationes comitatenses; 305 other units in the Eastern limitanei and 181 in the Western limitanei. According to the late Roman writer Vegetius' De Re Militari, each century had a ballista and each cohort had an onager, giving the legion a formidable siege train of 59 Ballistae and 10 Onagers, each manned by 10 libritors (artillerymen) and mounted on wagons drawn by oxen or mules. In addition to attacking cities and fortifications, these would be used to help defend Roman forts and fortified camps (castra) as well. They would even be employed on occasion, especially in the later Empire, as field artillery during battles or in support of river crossings. Despite a number of reforms, the Legion system survived the fall of the Western Roman Empire, and was continued in the Eastern Roman Empire until around 7th century, when reforms begun by Emperor Heraclius to counter the increasing need for soldiers around the Empire resulted in the Theme system. Despite this, the Eastern Roman/Byzantine armies continued to be influenced by the earlier Roman legions, and were maintained with similar level of discipline, strategic prowess, and organization. Legatus Augusti pro praetore, Imperial Legate: The commander of two or more legions. The Imperial Legate also served as the governor of the province in which the legions he commanded were stationed. Of Senatorial rank, the Imperial Legate was appointed by the Emperor and usually held command for 3 or 4 years. In the present time, an Imperial Legate would be called a General. Legatus legionis, Legion Legate: The overall legion commander. The post was usually filled by a senator, appointed by the emperor, who held command for 3 or 4 years, although he could serve for a much longer period. In a Roman province with only one legion, the legatus was also the provincial governor. In such circumstances, the Legatus was dual-hatted as both Legion Legate and Imperial Legate. The Legion Legate also served as commander of the auxiliary units attached to the legion though they were not formally a part of the legion's command structure. Tribunus laticlavius, Broad Band Tribune: Named for the broad striped tunic worn by men of senatorial rank, this tribune was appointed by the emperor or the Senate. Though generally young, he was more experienced than the tribuni angusticlavii, he served as second in command of the legion, behind the legate. Because of his age and inexperience he was not the actual second in command in battle, but if the legate died he would take command of the legion. Praefectus castrorum, Camp Prefect: The Camp Prefect was third in command of the legion. Generally he was a long serving veteran from a lower social status than the tribunii whom he outranked, and who previously had served as primus pilus and finished his 25 years with the legions. He was used as a senior officer in charge of training a legion, though he could also command a cohort of auxiliaires. Tribuni angusticlavii, Narrow Band Tribunes: Each legion had five lower ranking tribunes, who were normally from the equestrian class and had at least some years of prior military experience. They often served the role of administrative officers. This tribunate was often a first, but optional, step in a young man's political career (see cursus honorum). The rank of centurion was an officer grade that included many ranks, meaning centurions had very good prospects for promotion. The most senior centurion in a legion was known as the primus pilus (first file or spear), who directly commanded the first century of the first cohort and commanded the whole first cohort when in battle. Within the second to tenth cohorts, the commander of each cohort's first century was known as a pilus prior and was in command of his entire cohort when in battle. The seniority of the pilus prior centurions was followed by the five other century commanders of the first cohort, who were known as primi ordines. Primus pilus, literally First File: The Primus Pilus was the commanding centurion of the first century, first cohort and the senior-most centurion of the entire legion. (Unlike other cohorts, the first cohort had only one javelin century, instead of a "front spear" and a "back spear" century.) The primus pilus had a chance of later becoming a Praefectus Castrorum. When the primus pilus retired, he would most likely gain entry into the equestrian class. He was paid 60 times the base wage. Optio: One for each centurion (59–60), they were appointed by the centurion from within the ranks to act as his second in command and were paid twice the basic wage. Equivalent to a modern First Sergeant or Lieutenant. Tesserarius: (Guard commander) One for each century. They acted as seconds to the Optios and were paid one and a half times the basic wage. Keeper of the watchword, administrative assistant to HQ Staff, third in command of a century. Equivalent to a modern Staff Sergeant. Immunes: Immunes were legionary soldiers who possessed specialized skills, qualifying them for better pay and excusing them from labour and guard work. Engineers, artillerymen, musicians, clerks, quartermasters, drill and weapons instructors, carpenters, hunters, medical staff and military police were all immune soldiers. These men were still fully trained legionaries, however, and were called upon to serve in the battle lines when needed. Evocatus: A veteran of the Roman army who had earned his military diploma for military service, but had chosen to re-enlist. They received double pay and were excluded from regular duties, such as manual labour. From the time of Gaius Marius onwards, legionaries received 225 denarii a year (equal to 900 Sestertii); this basic rate remained unchanged until Domitian, who increased it to 300 denarii. In spite of the steady inflation during the 2nd century, there was no further rise until the time of Septimius Severus, who increased it to 500 denarii a year. However, the soldiers did not receive all the money in cash, as the state deducted a clothing and food tax from their pay. To this wage, a legionary on active campaign would hope to add the booty of war, from the bodies of their enemies and as plunder from enemy settlements. Slaves could also be claimed from the prisoners of war and divided amongst the legion for later sale, which would bring in a sizeable supplement to their regular pay. All legionary soldiers would also receive a praemia on the completion of their term of service (to receive this the minimum was 25 years in service): a sizeable sum of money (3,000 denarii from the time of Augustus) and/or a plot of good farmland (good land was in much demand); farmland given to veterans often helped in establishing control of the frontier regions and over rebellious provinces. Later, under Caracalla, the praemia increased to 5,000 denarii. Reenacters portraying Roman legionaries of Legio XV Apollinaris. In Gallic War (Bk IV, Para. 25), Julius Caesar describes an incident at the start of his first invasion of Britain in 55 BC that illustrated how fear for the safety of the eagle could drive Roman soldiers. When Caesar's troops hesitated to leave their ships for fear of the Britons, the aquilifer of the tenth legion threw himself overboard and, carrying the eagle, advanced alone against the enemy. His comrades, fearing disgrace, 'with one accord, leapt down from the ship' and were followed by troops from the other ships. With the birth of the Roman Empire, the legions created a bond with their leader, the emperor himself. Each legion had another officer, called imaginifer, whose role was to carry a pike with the imago (image, sculpture) of the emperor as pontifex maximus. Decimation – According to 17th century belief (possibly folk etymology), the Romans practiced this punishment in which a sentence was carried out against an entire unit that had mutinied, deserted, or shown dereliction of duty. One out of every ten men, chosen by lots, would be beaten to death, usually by the other nine with their bare hands, who would be forced to live outside the camp and in some instances obliged to renew the military oath, the sacramentum. Examples of ideas that were copied and adapted include weapons like the gladius (Iberians) and warship design (cf. Carthaginians' quinquereme), as well as military units, such as heavy mounted cavalry and mounted archers (Parthians and Numidians). Roman discipline (cf. decimation (Roman army)), organization and systematization sustained combat effectiveness over a longer period. These elements appear throughout the legion in training, logistics, field fortification etc. The Romans were more persistent and more willing to absorb and replace losses over time than their opponents. Wars with Carthage and the Parthians and most notably, the campaigns against Pyrrhus of Epirus, illustrate this. The influence of Roman military and civic culture, as embodied particularly in the heavy infantry legion, gave the Roman military consistent motivation and cohesion. Roman military equipment (cf. Roman military personal equipment), particularly armor, was more withstanding and far more ubiquitous, especially in the late Republican and Early Imperial era, than that of most of their opponents. Soldiers equipped with shields, helmets and highly effective body armor had a major advantage over warriors protected, in many cases, with nothing other than their shields, particularly in a prolonged engagement. 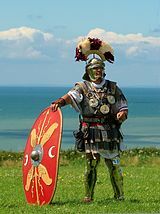 For a more detailed analysis, as well as the Romans in battle, see the articles Roman infantry tactics and Roman military personal equipment. ^ a b Manousos Kambouris, Spyros Bakas (2016). "Greco-Macedonian influences in the manipular Legion system". Archaeology and Science. 11 2015: 145–154. ^ Several Authors (17 December 2015). History of The Roman Legions: History of Rome. Self-Publish. pp. 1069–. GGKEY:DXPWT430TXP. ^ "It's totally fine to use 'decimate' as a synonym for 'devastate'. This is why". Merriam-Webster. Retrieved October 24, 2018. This page was last edited on 17 April 2019, at 12:31 (UTC).